Rhonda Marshall, 58, waves to visitors outside the Hacienda public housing complex. She’s been living on the high-rise’s first floor for years and has watched the building deteriorate. She says she sees cracks in the walls running from the sixth floor to the ground and smells mold in the hallways and stairwells. 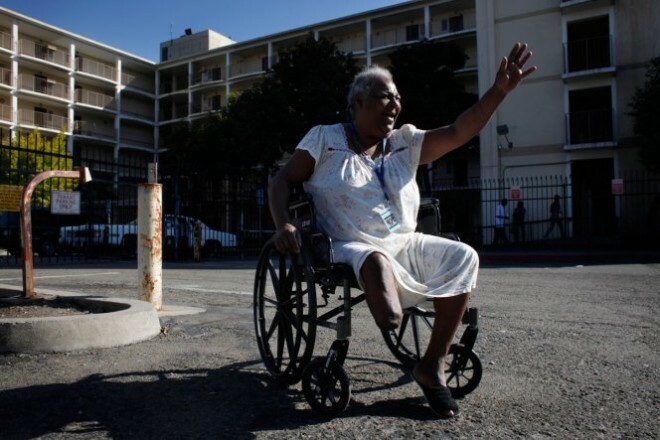 The last of the 100 elderly and disabled residents of the worst public housing complex in Richmond, California, have moved out, nearly two years after the city’s housing director declared their apartment complex uninhabitable following a Reveal investigation. Officials with the Richmond Housing Authority had promised that all the residents would be relocated by August, but dozens of sick and frail seniors continued to languish in squalid conditions as the city scrambled to find affordable housing options in the San Francisco Bay Area’s tight rental market. Many private landlords had extensive waitlists or did not accept the federal Section 8 subsidies residents rely on to pay for their housing. At least two seniors did die while they were waiting to be moved, Hacienda residents said, and several more were hospitalized. Inspections stretching back years showed serious problems at Hacienda that went largely ignored by the housing authority. The most recent inspection revealed that half of the apartments were infested with roaches. Almost a fifth of them had mold. Residents regularly were trapped inside faulty elevators. Hacienda’s sixth floor sat vacant for two years due to roof leaks so severe that stalactites grew from the overhead walkway. Richmond’s City Council voted in March 2014 to evacuate the residents, but shied away from an immediate move after realizing it would cost about $700,000. Instead, Richmond asked the U.S. Department of Housing and Urban Development to finance the relocation. Last February, HUD approved $1 million in federal funding to relocate residents while a nonprofit developer renovates the building. Gary is relieved to finally be out of her apartment in Hacienda, the place she called home for 14 years. She found a two-bedroom apartment down the road in Richmond. Hacienda will be leased to Mercy Housing, a nonprofit developer that will use low-income housing tax credits to revitalize the building. Once the $19 million in estimated renovations is complete, the building again will provide affordable housing, according to a HUD document. This story was edited by Amy Pyle and copy edited by Nikki Frick.